A sheep farmer in Australia has discovered a fossil of the world's oldest vertebrate - the common ancestor of all animals with a backbone. Sheep station owner Ross Fargher found the fossil among a number of strange shapes embedded in sandstone slabs on his farm. But after taking it home, he left it on his veranda for four years before scientists identified its importance. At 560 million years old, the fossil is around 30 million years older than the next oldest vertebrate remains found so far, in China. "All that came before it presumably was something that was absolutely microscopic, the size of an amoeba or a tiny organism, that wouldn't be represented in the fossil record," palaeontologist Dr Jim Gehling, of the Museum of South Australia in Adelaide, told BBC World Service's Science In Action programme. "What it actually represents, I guess, is the deepest part of the tree of life." Dr Gehling explained that the fossil was about six centimetres long, with a head shield and a top dorsal crest. There was also a possibility it had once had a fin. He said that the creature "gave rise to everything that has some kind of stiffening rod or backbone". The group is collectively known as chordates - vertebrates are only one type of chordates, defined by the fact that their backbone is mineralised. "We'd call this a stem group chordate - one that is right at the bottom of the line," he added. As a result, it was a very important find in tracing the origin of our own species, man. "Animals as we know them split off into many different branches very early on in the piece - the problem is just how early," Dr Gehling stressed. "It's been assumed that they really only started to split off pretty much at the beginning of the Cambrian [Period, about 545 million years ago]." This theory had been contested over the last 20 to 30 years, however - and the new discovery added weight to claims that man's origins were much older than first believed. 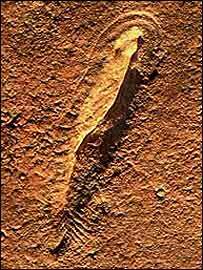 Dr Gehling also outlined the extraordinary story of how the fossil had been found in the first place. "The local sheep farmer - who is not a palaeontologist - had a very good eye and he noticed he had some very curious shapes on some sandstone slabs," he said. These slabs had been looked at by friends, who in turn had contacted the Museum of South Australia. The remarkable fossil was among these slabs. "It was discovered and lay there on his bungalow veranda for about five years before anyone got to study it in any detail," Dr Gehling added. At first the scientists had believed the special fossil was a type of spriggina - another type of creature from the early stages of evolution - but rubber casts had revealed it was something quite different.